Smooth Sailing from Here On Out, Right? This past Saturday (November 15, 2014) marked the beginning of the open enrollment period for 2015 Affordable Care Act plans. All indications are that this year’s enrollment period is functioning much smoother than last year’s, which is good for the administration. The national website has functioned much better than last year and a majority of the individuals who accessed the site were able to get everything done that they need to in an efficient manner. There were some minor issues facing some state-run exchanges, specifically Washington state, where the site had to shut down because the information it was providing on subsidies was inaccurate. But this issue and many other ones were resolved quickly and the websites have returned to functioning effectively. Now that there has been an effective rollout everything is perfect for the law now, or is it? Forget for a second that Republicans have expanded their control in the House of Representatives and taken control of the Senate. There are issues that this law is facing that would have needed to be worked out even if the Democrats maintained their control of the Senate. The first issue is one that I have written about in the past: a lack of public knowledge on the enrollment period and the healthcare law in general. A poll that was taken in November right before the opening of the enrollment period suggested that more than 50 percent of uninsured individuals did not know when the open enrollment period was beginning. Additionally the poll revealed that 44 percent of these uninsured individuals plan to remain that way while 33 percent were waiting to see if there is a plan they would be interested in, or if their employers will offer a plan that interests them. This could be a bigger problem for the law if you take into account that many of these uninsured individuals fall into the group known as young invincibles who would help curve the risk pool and drop insurance prices for all involved. Moving forward, there will have to be significant improvements made towards educating the public – assuming supporters want the public to be informed on the law – or nothing that was promised during the creation of the Affordable Care Act will come to fruition. The Affordable Care Act faces a huge challenge in the courts this upcoming winter when the Supreme Court will hear the King v. Burwell case. In deciding to hear the case, the Supreme Court put the health law’s supporters on edge, as a ruling against the federal government means that subsidies can no longer be provided to individuals who purchase insurance through the federal exchange. The court’s decision to hear the case brings up a much larger issue with the bill: the administration has been way too free with its ability to interpret law in any way that it wants. If the Affordable Care Act continues to live under a veil of ambiguity there will be several new issues that arise. These issues could derail the law, not only now in the King v. Burwell case, but in additional areas down the road that could arise as the complex law continues to be implemented. The cloud of complexity could also have obscured the financial burdens of the law, which could lead to unexpected funding problems. Finally, as previously mentioned, the Republicans have taken control of the Senate. This means that the opportunity has been presented to scale back so of the more unpleasant portions of the law, many of which appear to have disapproval from both Republicans and Democrats. The systematic restructuring of these portions of the law may just be what is best for it and for the healthcare landscape in our nation. The goal of the new congress, which convenes for the first time in January, should be to work to clear up a lot of the clutter that the Affordable Care Act has created in the healthcare market. Many of these problems that the Affordable Care Act has created cannot be solved easily and it will take a lot of work by both sides of the isle. But the question remains: Will the administration be willing to work with Congress for the betterment of the health law? If the Affordable Care Act is to survive and become a beneficial bill for the country, the president will need to meet with the Republicans at least half way. Over the next couple of weeks, months even, there will be several stories out there claiming that all of the problems facing the Affordable Care Act have been solved due to the smooth rollout that began Saturday (November 15, 2014). However, that is simply not true. There are still several problems that the law is facing, and if nothing is done soon, this bill could become a runaway train that would pass the point of no return and have the potential to do permanent damage to the nation’s healthcare system. 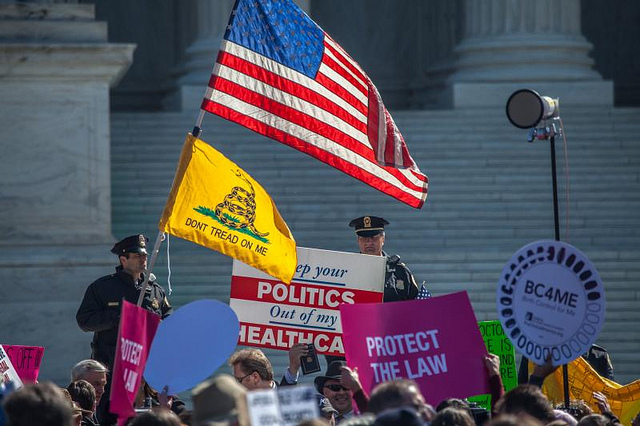 Tags: Affordable Care Act, health care, King v. Burwell. Bookmark the permalink. Previous post ← Stewart & Colbert Nation?